Kerala Strikers and Karnataka Bulldozers Enters the finals of CCL 4. 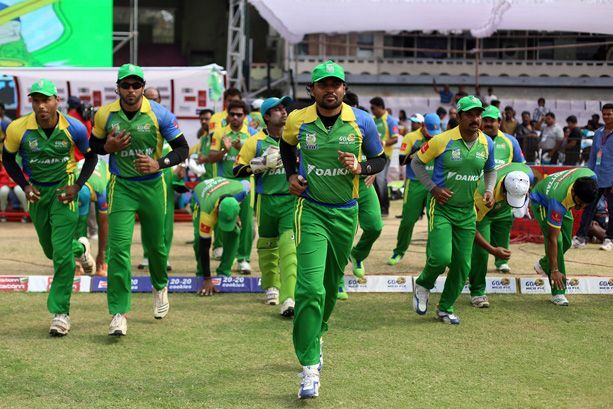 The Finals Match of Celebrity Cricket League 2014 will held today. This is the very first time, Amma’s Kerala Strikers Team Enters the finals. The Match is on Sunday, 23rd February 2014 at 5.00 pm to 9.00 pm. The Venue for CCL 4 is Lal Bahadur Shastri Stadium, Hyderabad. Malayalam Channel Asianet will Telecast the Final of CCL 4 Live. In the First Semi finals of CCL 4, Kerala Strikers Defeated Bhojpuri Dabanggs. Karnataka Bulldozers Win Against Mumbai Heroes in the Second Match. 1st Match – In the Very first match they defeated the Team Telugu Warriors. In that Match Kerala Strikers won by 4 wickets. 2nd Match – Kerala Strikers Team Played The Second Match Against Veer Marathi. Again They Made a Win by 3 wickets. 3rd Match – At the Hoe Ground Match Against Chennai Rhinos, Amma’s Kerala Team Made History. They won by 12 runs. 4th Match – The Last League Match of Kerala Strikers Team Against Bengal Tigers abandoned due to Bad Weather. Karnataka Bulldozers’s Performance to Reach the Final Of CCL Season 4 – Defeated Bengal Tigers by 115 runs, Match Tied against Chennai Rhinos, Win Against Veer Marathi by 5 Wickets, Win Against Telugu Warriors by 6 wickets. They Beat the Mumbai Heroes by 79 runs in the Second Semi Finals. Final Of CCL Season 4 Is Live On These Television Channels – Rishtey, Asianet, Suvarna, Zee Telugu and Big Magic. This Is The Last Match of Celebrity Cricket League 2014. Season 4 of CCL is Started on 25th January 2014. Karnataka Bulldozers, Telugu Warriors, Kerala Strikers, Veer Marathi,Bhojpuri Dabanggs, Chennai Rhinos, Mumbai Heroes, Bengal Tigers are The Teams In CCL 4.